The scientific name of African coriander: Eryngium foetidum L.
English: Mexican coriander, Long coriander, Fitweed. It is an annual to biennial herb, pungently scented, grow to 15 to 45 cm tall with the taproot. In India, it is reported to be perennial. The leaves are arranged in a basal rosette form, leaf blades are lanceolate to oblanceolate or spatulate in shape, margins spinous toothed. Flowering shoots divaricately branched, bear more deeply toothed leaves. Flowers are white in cylindrical heads, subtended by a whorl of about 2-3 cm long, 5-6 unequal bracts resembling the upper leaves. Calyx teeth ridged and acute. Petals white or greenish, fruits are ellipsoid or subglobose and greenish. Seeds are semiterete. The leaves and roots are used to prepare as tea, which will stimulate appetite, improve digestion, combat colic, soothe stomach pains, and eliminate gases and as an aphrodisiac. The decoction of leaf and root is used in the treatments of Pneumonia, fever, dysentery, constipation, diabetics, and vomiting. Oil contains linalool, decanal, mesit aldehyde, 2-dodecenal, trans-2- dodecenal, trans-2-tridecenal. 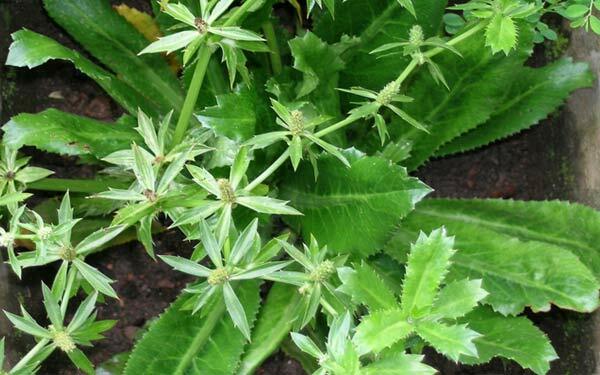 Pungent, anti-clastogenic, anti-carcinogenic, stimulate appetite, anti-diabetic, aphrodisaic, stomachic, analgesic, anti-convulsant and anti-bacterial.